What is Causing My Testicular Pain? Home > Men's Problems > What is Causing My Testicular Pain? Pain in the testicles can be a sensitive, embarrassing topic for many men. Not only is it hard for them to talk about pain in this region, but the idea of having to let a GP or other medical professional take a look is often enough to keep them at home, suffering in silence. This is completely unnecessary. Understanding the symptoms of testicular pain, common causes of testicular pain, when to seek help and how to treat such pain at home should all help men get past this embarrassing issue as quickly as possible. Sexually transmitted diseases (STDs)/infections (STIs). Inflammation of the testicle (epididymitis). Build up of fluid in the testicle (spermatocele). Retraction of the testicle (pulling up inside the groin). Swelling of/in the scrotum (hydrocele). Enlarged/varicose veins in the scrotum (varicocele). 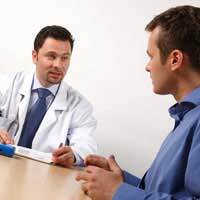 Pain in the testicles is not normal, that is men should not feel pain in their testicles every day as a matter of course. When pain does appear it should be treated as significant until proven otherwise. This means seeking help from a GP or another medical professional as soon as possible. Seek emergency treatment if the pain is sudden or severe, or if it is accompanied by nausea, fever, chills, or blood in the urine. Seek treatment as soon as possible if mild pain lasts more than a few days or if a lump or swelling is noticeable anywhere in or around the testicles or groin. If you are in doubt about the significance of your pain, err on the side of caution and seek help as soon as possible even if it requires a trip to hospital. If you are certain that your testicular pain does not require emergency treatment and you must wait a few days to see your GP there are things you can do at home to help relieve discomfort. Over the counter pain medications such as aspirin, ibuprofen or acetamenaphin may help though be sure to ask your chemist for dosage instructions. Supporting the testicles with underpants or athletic supporters may help relieve pain, as may lying down and using a rolled towel or cloth for support. Applying an ice pack may help relieve swelling, though it will need to be well wrapped in fabric to keep the cold from irritating sensitive skin. Testicular pain can be embarrassing, but it must be treated as significant until a medical professional tells you otherwise. Take note of the symptoms of your pain, understand common causes of testicular pain and become familiar with when to seek help and when to treat such pain at home in order to rectify the situation as soon as possible. Baldness: What Can I Do About It? Have you had your scan? That should help establish the cause of the pain. Your scan will be followed up by advice from a consultant. "Diagnosed/Treat Promptly Testicular Anormally and healed me promptly". "act"